After a long, hot summer, a change in the weather can be welcome. A little breeze to stir the stuffy air, a little rain to wash the stickiness away. In 1900, the first signs of an approaching storm brought crowds to the beach to watch the waves, but the holiday atmosphere would soon be over. 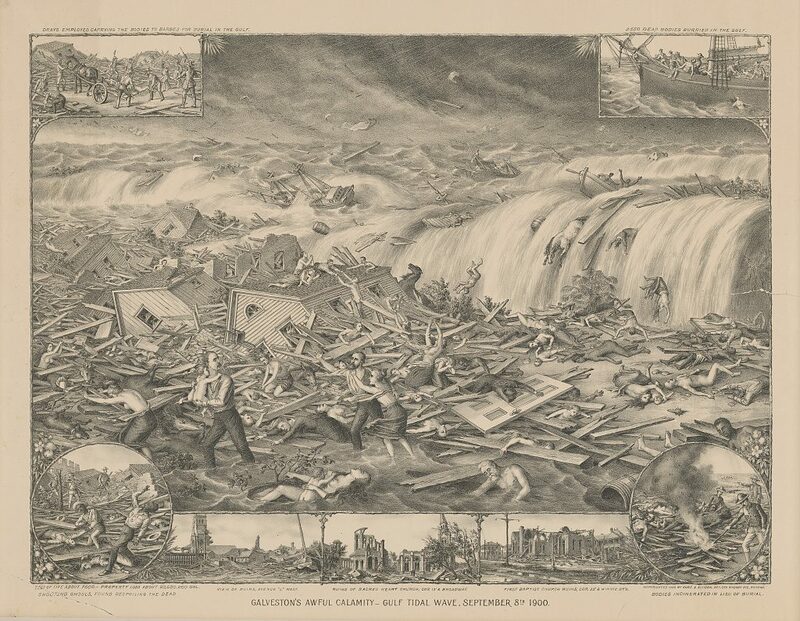 It was no mere squall coming in from the Gulf, but a hurricane, and by the following day there would not be a single building in the city standing undamaged. At the very beginning of the twentieth century, Galveston was the place to be. Known as the Queen City of the Gulf, it was the fourth biggest city in the state of Texas, a major centre of commerce and business, and one of America’s biggest cotton ports. It was the first city in the state to get telephone lines and electric street lights, an opera house, an orphanage and much more. It was more prosperous than Houston, with one of the highest per capita income rates in the country, and its most prominent residents lived in fabulous mansions. Galveston’s location, on a barrier island with the Gulf of Mexico on one side and Galveston Bay on the other side, made it a great tourist destination, too, with extensive beaches to enjoy. John W. Thomason Jr. visited the city in the summer of 1900. He left on the first of September, and recalled being reluctant to do so. The timing of his departure would, however, turn out to be very fortunate for him. 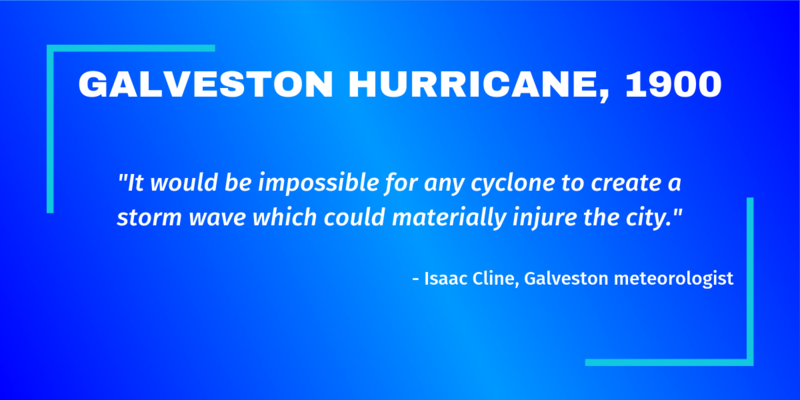 Just one week later, Isaac Cline, the chief meteorologist at Galveston’s Weather Bureau office, received orders from his head office in Washington DC to raise the storm warning flags. 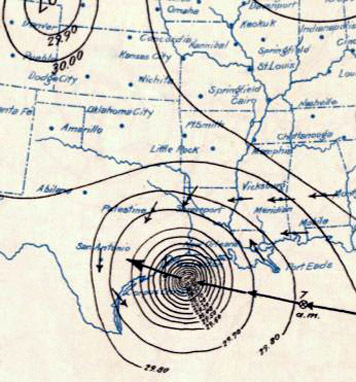 A “storm of moderate intensity” had been observed leaving Cuba, and had initially been predicted to sweep over Florida before turning north-east, leaving Galveston clear. However, on Friday the 7th of September this forecast was abruptly changed. High winds had been observed in Key West, but the storm had not moved across Florida as expected. It was still in the Gulf of Mexico, and it was now moving towards Galveston. This didn’t cause any particular concern for most, as noted by Clarence Ousley, editor of the Galveston Tribune. 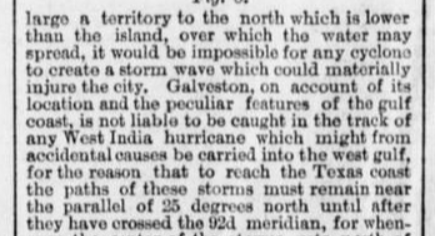 He explained that cyclones from the Gulf would “generally turn to the northeast and touch east of the 87th meridian, somewhere on the coast of Florida, or pass northward to the east of the continent in the Atlantic ocean.” This theory was backed up by an analysis of twenty such storms over the last twenty years, of which he said only two had reached the Texas coast, and those two had followed an “abnormal” path. At first, the change in the weather was actually welcomed by many; it had been hot and still for some time, so it was a nice relief. Cline, alongside his brother Joseph and another observer from the weather bureau, John Blagden, continued to make their observations carefully. Throughout the Saturday morning, the weather office was kept busy answering queries from citizens, advising people to move perishable goods to higher storage and seek shelter. Meanwhile crowds gathered at the beach to watch the awe-inspiring sight of the waves, the streetcars shuttling them back and forth until waves lapped at their tracks. That same morning, civil engineer A. V. Kellogg set off on a train from Houston to Galveston. He recalled that, as they crossed the bridge over Galveston Bay, the water was just two feet below the level of the track. A couple of miles further along, the train came to a halt. The track ahead had been washed out. They waited an hour for a relief train to come out on an adjacent line, which stood a little higher, but the rest of their journey was still perilous. He finally reached Galveston at around quarter past one, and made his way to the shelter of the Tremont Hotel. Ida Austin recalled being busy with her normal domestic duties that day, until a man ran up the street crying out that the waters of the Bay and the Gulf had met on Fifteenth Street. “I went on the gallery to realize that what he said was only too true. But I felt no uneasiness and remarked to my niece, ‘We have nothing to fear, the water has never been over our place,’ and I just felt that it could not come. In a few minutes we heard the lapping of the salt water against the sidewalk, and then it slowly crept into the yard. By three p.m., the Clines were becoming very worried about the approaching storm. While Isaac went home – he had been on duty since 5 a.m. – Joseph attempted to send the message to their head office. He waded through water two to four feet deep to reach the telegraph offices, where he found that wires were all down. So he went back to the office. There, he found that it was still possible to telephone through to Houston, although that line, too, went down just as he finished passing his message on. Then he went to rejoin his brother. Isaac Cline’s house stood only a few blocks from the Gulf, but he was confident it would withstand the storm. It had been rebuilt just four years earlier after a fire, and he believed its construction was sturdy enough for any weather. Inside, he had not only his pregnant wife and three daughters, but also many others who he had brought inside for shelter. The water had been waist deep when Isaac got home; by the time Joseph followed, it was practically up to his neck. He updated Isaac on the last readings from the office, and recommended that they move towards the city. Isaac thought it safer to stay put. Over at the Tremont Hotel, Kellogg watched the approach of the storm, and those who fled before it. Whilst the Tremont stood, other sturdy brick-built buildings didn’t offer the security that many hoped for. Onlookers saw the fourth floor of the W.L. Moody building get sheared away “as if it had been sliced off by a cleaver.” Many people had packed into the towering City Hall for refuge, but because it stood higher than any neighbouring structures it was unprotected from the wind. The windows blew in, casting glass in shards over everyone inside, one of its majestic turrets was torn loose to crash into the street, and the roof came off, taking most of the third-floor wall with it. The Grand Opera House similarly caved in, along with the top floor of the neighbouring Grand Hotel. In the three storey Lucas Terrace, the first all-brick apartment complex in Texas, Mary Quayle watched in horror as a window blew out just as her husband stepped in front of it; he was sucked out into the storm, never to be seen again. The majority of the building collapsed, but Mary and nineteen others managed to cling on inside the last flat standing. Back at the Cline’s house, the meteorologist continued to observe the storm as long as he could. Cline himself came close to drowning, but recovered his senses and found himself clinging on to his youngest daughter. Joseph saved Cline’s other two daughters, and alongside another woman and child they drifted, clinging to wreckage, for three hours. Ruby Credo, then just eight years old, was one of those people. The Credo family moved from one piece of wreckage to another, ending up on a sturdy porch. In addition to Vivian, Ruby’s father lost two grown daughters, a son, a son-in-law and four grandchildren to the storm. Despite that, he considered himself lucky that so many of them had survived. William McIlhenny did not fare so well. He had led his family, plus a friend’s child who was visiting, up onto his roof to escape the rising water. There, a piece of timber thrown by the wind hit McIlhenny’s son and swept him away. Then, the waves carried away the visiting child, McIlhenny’s eldest daughter and her younger son. Another flying plank took his remaining grandson. Finally, the roof they were clinging to tore apart, taking his wife away. Alone, McIlhenny clung to that last piece of his house until he finally washed up, eight hours and some miles away. And he was far from the only one to endure a crazy ride that night. Sixteen year old Anna Delz clung to various pieces of debris as she was battered, bruised and stripped naked by the storm, eventually coming to rest eighteen miles away. Henry R. Decie was swept nearly thirty miles away, coming ashore near Cow Bayou. While many struggled simply for their own survival, there were some heroes who fought to save as many others as possible. W.H. Plummer was a city police officer who had spent many years at sea, and was therefore known as Captain Plummer. He had a sturdy boat in his backyard, so when the storm came in he and his two sons dressed for the bad weather and launched the boat into the city’s streets. For hours they worked to ferry people to relative safety, but at first, few were convinced it was necessary. Conditions changed quickly. In several places where his assistance was turned away, when he next came past those houses, and all their occupants, were gone. However, he was able to take a lot of survivors to the shelter of St Mary’s Infirmary, delivering them to a second-floor window. They carried on this was until the boat was capsized by debris, thankfully close enough to the infirmary for Plummer to make it to safety himself. The Infirmary might not have been an obvious choice for shelter; it stood on one of the narrowest parts of the island, with shoreline six blocks away on one side and three blocks away the other side. However, it did turn out to be a canny one. Although the windows were blown out, the refugees were soaked by the rain coming in through holes in the roof, the water rose to the top of the staircase and part of the wall caved in, the building remained standing. The buildings that had surrounded it were swept away before they could clump together into the kind of battering ram that had taken out Cline’s home, and many others. 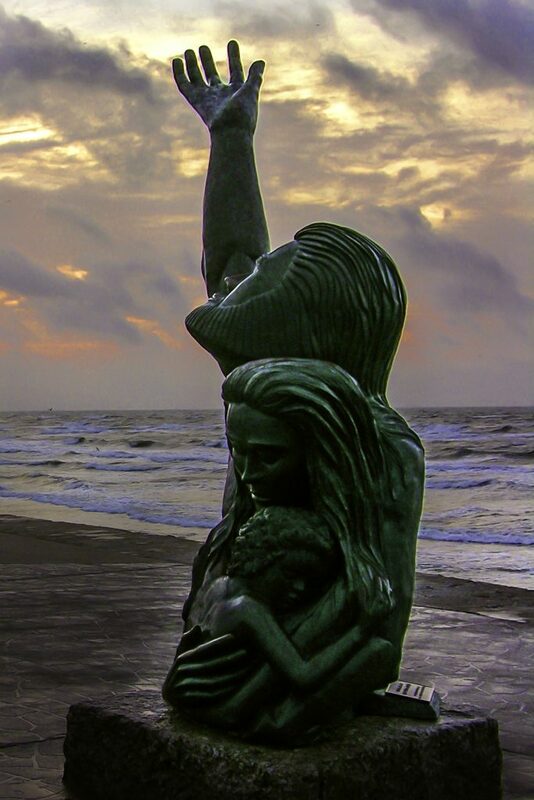 One of the most famous stories of tragedy from the Galveston storm came from St Mary’s orphanage. Standing three miles west of the town, it was an isolated home for ninety three girls and boys, from infants to early teens, and the ten Sisters who cared for them. As the storm came in, the nuns used clothesline to tether the children to them in groups, like strings of precious pearls. 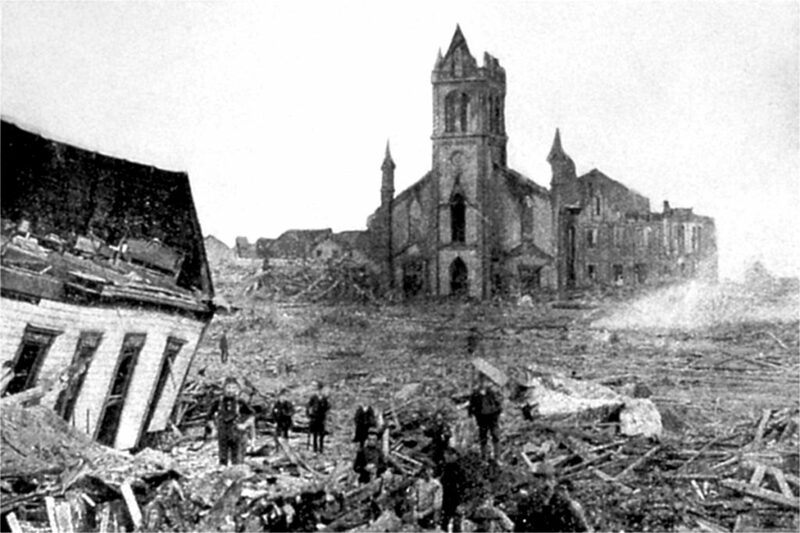 They moved first into the chapel to pray, and then into the second-floor girl’s dormitory, but the building collapsed. Three teenage boys survived; they had not been tethered to the Sisters because they were older and able to swim, and managed to hang on to a floating tree throughout the night. All the others were killed. One of the nuns would be found later at Virginia Point, three miles away, the bodies of nine children still tied to her waist. At around ten o’clock that night the force of the storm began to fall; when the Clines were washed up at around 11:30 he noted that the water level had dropped around four feet, and by the next morning it was normal. George McLaine described the varying reactions of the survivors. In the aftermath of the storm, Galveston was practically cut off. The only way to get word out about the disaster, in order for aid to be sent, was to find a boat that remained seaworthy and cross the bay. Through high waves and floating corpses, a group of volunteers made it eight miles to Texas City. From there they took a wagon to La Marque, and eventually a train to Houston, where Richard Spillane, commercial editor of the Galveston Tribune, was able to send a message out to Texas Governor Joseph D Sayers and President William McKinley. Spillane’s estimate of the dead was woefully low; Cline’s more realistic. Estimates ranged as high as twelve thousand. Eight thousand, a reasonable estimate which is generally favoured today, represented 20% of the island’s population. And the survivors now needed to deal with the dead. 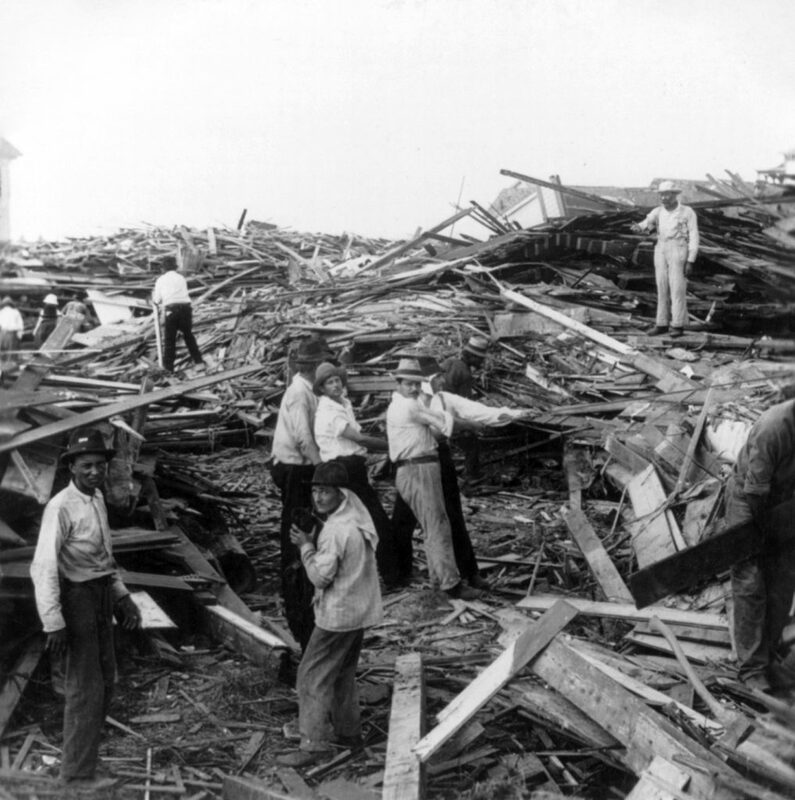 Milton Elford was another Galveston resident who had survived the collapse of his house and several hours adrift. It was now obvious that the confidence Cline and many others had maintained in the location and geography of Galveston was misplaced. Terrible storms could indeed overwhelm the island, and there was obviously no way to stop them, so if the island was to survive, measures had to be taken to counter them. A seawall – something that had been proposed some years before – was now to be built. Construction began in 1902, and the first segment was completed in 1904. 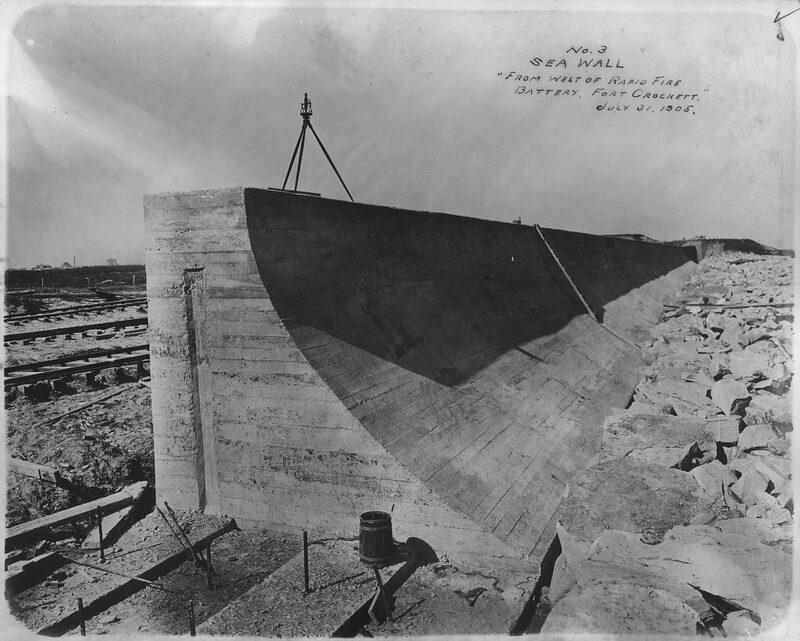 This was not a quick job either; construction work on the seawall continued until 1963. 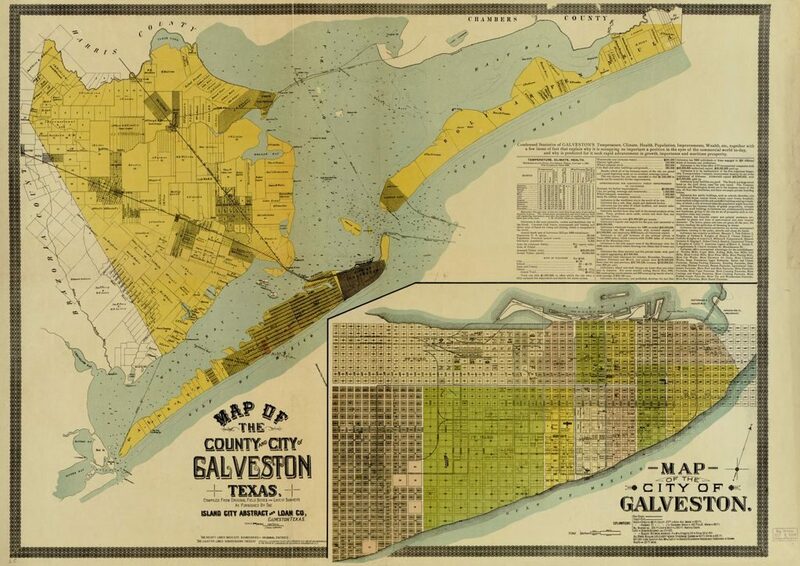 In the meantime, another huge venture was launched to protect Galveston’s residents; the raising of the island itself. Over two thousand buildings were raised on jackscrews; the channel was dredged to provide fill material which was pumped in underneath. All of the infrastructure had to be raised too – sewer and gas lines, streets and sidewalks. By the time it was done, in 1911, some sections of the city had been raised by seventeen feet, or 5.2 metres. That meant that a storm surge of the same size would not be able to do so much damage. These measures were to prove their worth quite quickly. 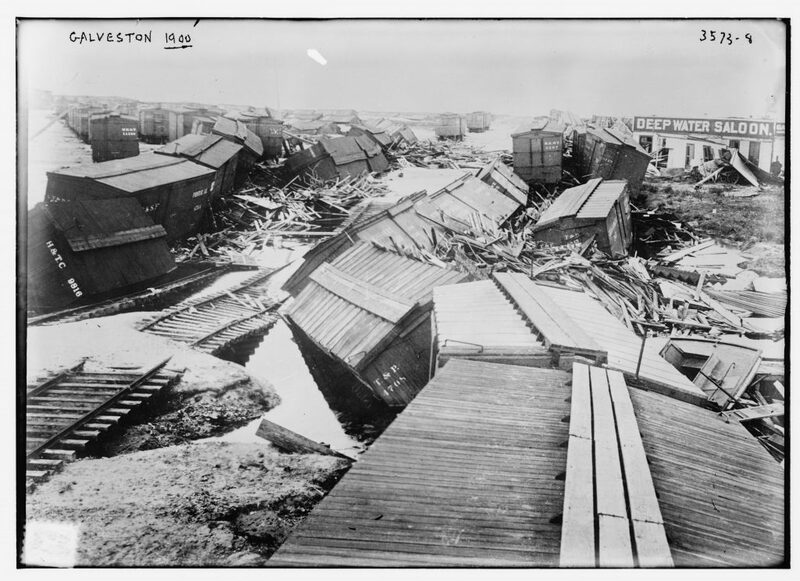 In 1915, Galveston was struck by another storm, following a similar path to 1900 and with similar strength, bringing a storm surge of twelve feet, or four metres. This time, however, only 53 people on the island were killed. In the decades since, the seawall has been tested many times and has become a tourist attraction in its own right. 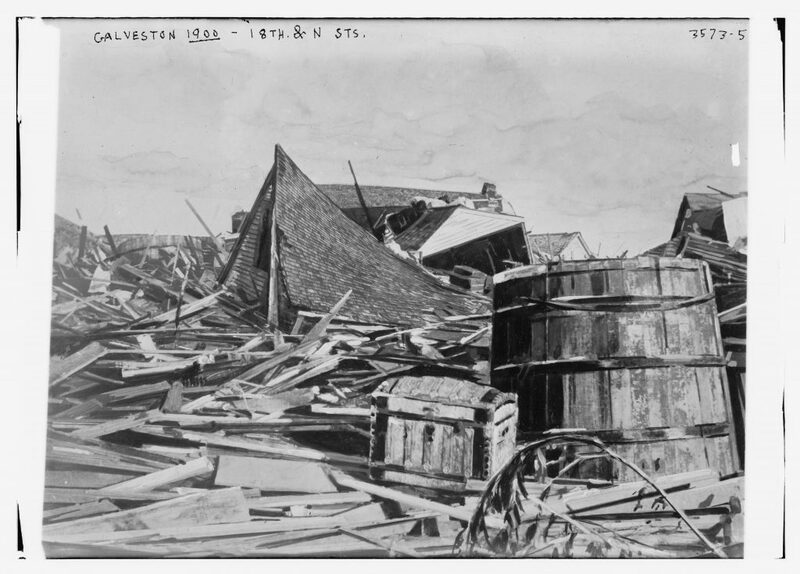 In 1983, it was estimated that it prevented about $100 million dollars in damage during the impact of Hurricane Alicia. However, it would be unwise to become complacent. Hurricane Ike in 2008 caused billions of dollars in damage. Ambitious proposals for further coastal defenses have been made, but there have been concerns about the environmental impact these might have, and they are still in the early phases. The other factor in the disaster was, of course, the lack of warning. By the time anybody in Galveston realised the severity of the storm, it was too late for them to escape. Although Isaac Cline was an experienced meteorologist, he was somewhat handicapped by policies of the Weather Bureau which required authorisation from the head office in Washington DC before any warnings could be issued. In addition, they often erred on the side of caution, avoiding words like “tornado” and “hurricane” because they might cause panic. The Weather Bureau was also, at the time, failing to make use of all the resources and information available to them. Before heading towards Texas, the Galveston storm had swept over Cuba; there had been a meteorological observatory there in Havana since 1858, run by Jesuit priests, who had established a pretty accurate forecasting model. They could see that it was a violent storm, and where it was heading. Unfortunately, since the Spanish-American war there had been a problematic relationship between America and Cuba, and this had led to the weather bureau not only ignoring but actively suppressing reports from Cuba. Willis Moore, director of the Bureau, had arranged for all communication from the Cuban weather forecasters to be restricted; such messages were banned from the government-owned telegraph lines in Cuba, and Western Union had agreed to apply what amounts to a modern bandwidth restriction on private telegraph lines; messages about the weather would be bumped to the back of the queue, delayed or even dropped altogether. Even if the forecast had made its way to Galveston in time, the issue of actually getting the message out to the entire city was problematic. The warning was given at the time by way of a flag raised over the weather bureau office; then people could call into or telephone the office for further information. Cline said later that he’d ridden along the beach telling people to seek shelter, but none of the survivors’ accounts mention hearing of it this way. Today, with the benefit of satellite and radar observations from all around the globe, easy communication through the internet and the ability to broadcast warnings right into people’s homes through a variety of media, it’s a lot easier for meteorologists to forecast the path of such storms, and give sufficient warning for people to leave the area. After all, when you get right down to it, the best place to be in a hurricane? Somewhere else.